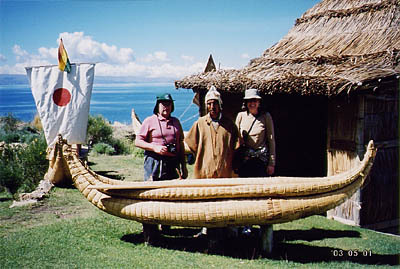 Traditional boat, Island of the Sun, Lake Titicaca. As seasoned travelers, we have seen and experienced the major attractions of Europe and Asia. Peter has also seen a good deal of Africa and, in fact, was born in Malawi. But even with our jaded perspectives, we were not sure what to expect of Peru and Bolivia. For myself, I knew it was an opportunity to finally cross the equator into the southern hemisphere; a first. But the real point of travel is to see and experience other cultures and landscapes, to put history into context, and to encounter the unusual and unexpected. South America is a whole different world, and the ancient cultures of Peru and Bolivia are historically the most interesting within it. 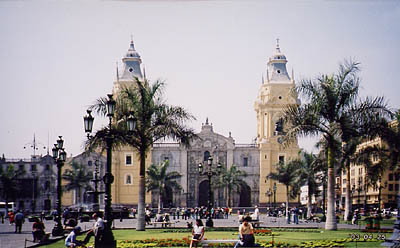 Lima Cathedral, Plaza de Armas. We arrived in Lima the evening of April 25 and stayed at the luxurious Country Club Hotel in the exclusive residential enclave of San Isidro. Our flight was six hours from Miami, but we remained in the central time zone so jetlag was not an issue. To unwind, we went to the hotel bar and enjoyed pisco sours, the national drink of Peru. They are made from pisco (a Peruvian grape brandy), lime juice, sugar, and a topping of eggwhite froth. They are delicious, but lethal if not sparingly consumed. The next morning we enjoyed a guided city tour of Lima. The city has many fine remaining examples of colonial architecture from the 16th-18th centuries. A large statue of Francisco Pizarro, the founder of Lima, is located near the Plaza de Armas. The government palace, cathedral, and town hall all surround a plaza containing a splendid bronze fountain dating from 1650. Many of the buildings have fine balconies that bear the stamp of Moorish Spain. 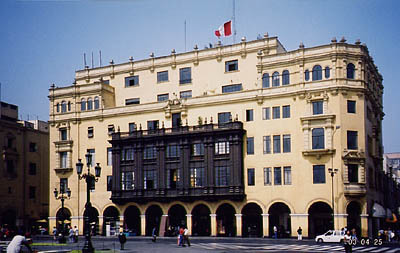 Town Hall, Plaza de Armas, Lima. We visited the Gold of Peru Museum in the afternoon, which houses a magnificent private collection of necklaces, funerary masks, scepters, ceremonial cups, sacrificial knives, nose rings, earrings, and idols; all made of gold and semi-precious stones. The collection is stunning, but we reminded ourselves of the huge quantities of gold and silver stripped from Peru and sent to Spain, where it was wrought into beautiful tabernacles and other religious objects that can be seen on display in Toledo. We enjoyed an early, quiet dinner in a restaurant located at the end of a pier in the Pacific Ocean. We watched the sun descend over the water as surfers dashed out to catch the last waves before dusk. The city of Lima is located on the coast in the narrow strip of desert between the water and the Andes, whose peaks are easily seen from many vantage points. While not known for its good weather, we were fortunate to enjoy a glorious, clear day and a brilliant sunset while dining on fresh seafood and good Peruvian wine. Basic Incan stonework, Machu Picchu. The next morning we had an early flight to Cuzco, the ancient Inca capital in the heart of the Andes of southern Peru. At over 10,000 feet above sea level, Cuzco is the archeological capital of the Americas and the oldest continuously inhabited city on the continent. The name "Cuzco" is a Spanish transcription for the Quechua (Inca language) word meaning "navel of the universe". Located on a nearby mountain are the imposing ruins of the Pisaq archeological complex, composed of various neighborhoods, terraces, and watchtowers. Also nearby is the Ollantaytambo complex, a huge agricultural, religious, and military center that reflects Inca town planning. There are enormous polyhedral boulders that form the walls with trapezoidal doorways set along narrow streets. The Incas were masters of stonework who built magnificent structures characterized by symmetry, simplicity, and precise fit. Multi-ton boulders were cut and polished and joined together without the use of mortar. In some cases, corners were held together with pins made of metal alloys. The Incas were aware of the instability of their mountain homeland and designed their structures to be resistant to powerful earthquakes. Indeed, a powerful quake struck Cuzco in the 17th century and leveled every single colonial building. 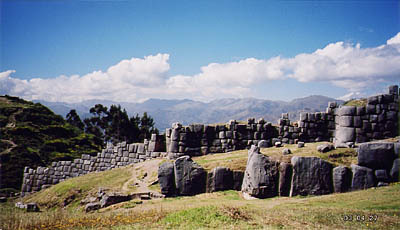 Only the Inca structures remained firmly intact. On the ride back to Cuzco, we saw a large, white statue of Jesus high on a mountaintop, arms outstretched, as if to bless the city lying below. It occurred to me that the Quechua people lived for 15 centuries with no knowledge of or belief in Christianity. Indeed, the indigenous cultures date back 14,000 years with the first known advanced culture (Chavin) appearing about 2,000 b.c. The people of Peru are indigenous or mixed (mestizo) and descended from either the Quechua or Aymara cultures. Quechua is the collective term for the indigenous people whose emperors and priests became known as the Incas. The Aymara people speak a pre-Inca language that evolved from the Altiplano (the Andean high plain covering southern Peru and northern Bolivia). After viewing Jesus, my instinct was to look up at the sky. From Cuzco's elevation we were treated to a blanket of stars that entire civilizations can wish upon. It is hard to find the words to give justice to the natural beauty of the Andes. The mountains are jagged and rocky, with glaciers tucked between snow-covered peaks. The air is clear and dry (April is the beginning of the dry season) and breezes whisper rumors of the Atacama Desert to the south and west. There is little industry in Peru and the limited number of vehicles means that the country has largely escaped the effects of the internal combustion engine that plague North America and most of the rest of the world. We departed by train for Machu Picchu on April 28. The train ride was spectacular, if not entirely comfortable. The narrow gauge car rolled and pitched through the mountain landscape as we followed the Urubamba River down to the town of Machu Picchu that has sprung up along the railroad terminus. Although not far from Cuzco, Machu Picchu has a completely different micro-climate that includes a level of humidity and vegetation that were more familiar to me, as a lifelong dweller of wet climates. When we arrived in Machu Picchu, we were aware of the lower elevation (still close to 10,000 feet, but well below Cuzco's lofty height) and the higher humidity. It was much easier to breathe. We stayed at the Sanctuary Lodge, which is the finest hotel in the area, located next to the Machu Picchu ruins. On the train ride we met a couple from Portugal who were the only other passengers. They stayed at our hotel and we enjoyed a very good dinner with them, all washed down with good Peruvian wine. Joao and Iolanda tipped off the staff that it was my birthday and the waiters brought birthday cake with a candle to our table for me. The following morning (which was, in fact, my 50th birthday), we woke at 6:00 and went straight into the complex to watch the sunrise above the mountains. It was a glorious morning as the rising sun burned off the mist in the valley below and revealed the verdant mountains that surround the Machu Picchu complex. 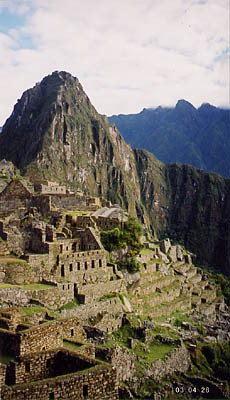 It is now believed that Machu Picchu was a retreat for the Inca elite, and not a religious site as previously thought. It seems appropriate to me that the Incas would have built a magnificent complex just for R&R in a place of such spectacular natural beauty. I like the image of Incas relaxing and having fun, rather than submitting themselves to the gods and making sacrifices to the sun. I can see them laughing at our archeologists and anthropologists who ascribed deeper meaning and spirituality to a place that was little more than a resort. 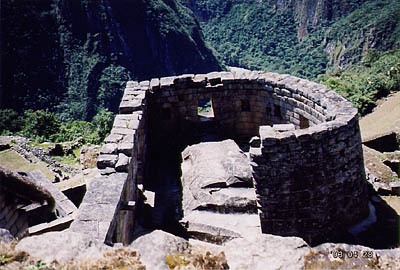 None of this diminishes the fine architecture and stonework that characterize all Inca constructions. 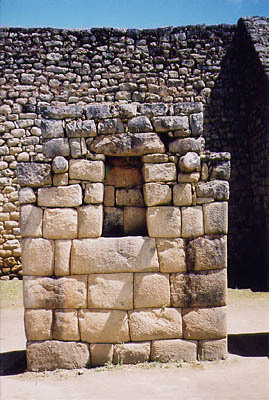 Three types of stonework are present at Machu Picchu. The most basic stonework was used for short walls that bolstered terraces and formed interior boundaries. The second type of stonework consists of convex stones that were carefully fitted together to make residences and government buildings. The best work was reserved for the Temple of the Sun and was made of precisely cut and fitted, flat-surfaced stones of perfect symmetry. The Temple of the Sun has the characteristic trapezoidal windows that are built in such a way that the rays coming from the winter solstice sun (June in the southern hemisphere) align themselves to form a perfect point of sun through the center. This is a typical Inca construction that is seen over and over in other archeological sites throughout the Andes. The best stonework at Machu Picchu was reserved for the Temple of the Sun. A few thoughts, observations, and theories on the Incas... We know that the Incas did not develop a written language. Indeed, the Maya were the only indigenous people in the western hemisphere to develop writing and their written language did not spread into South America. Given the complexity of Inca culture and its achievements in mathematics, architecture, and astronomy, it is something of an anomaly that they failed to develop hieroglyphs or writing. In thinking about it, I believe that there might have been a cultural bias against writing. Inca culture was highly stratified and hierarchical, with an all-powerful emperor who controlled every aspect of people's lives. The priests used religion and superstition to keep people at bay and ensure a huge and steady supply of docile Quechua labor necessary to push boulders up mountains to satisfy Inca architectural ambitions. Written language enables the rapid spread of information to all classes of people. Chinese culture has wrestled with this fact for millennia and emperors and Communist party leaders have all conspired to control the content and flow of information in order to maintain stability. It is not unreasonable, in my mind, to think that the Incas thought about writing or glyphs as a form of communication. We know they developed an accounting system using linear symbols and also used knots to communicate certain messages that were limited in scope to a very narrow audience. By limiting communication primarily to oral messages from emperor to priest to trusted adviser, the Inca elite ensured that access to information was highly restricted. This strategy served to solidify the existing, rigid hierarchies and class structure the society required in order to maintain its division of labor and concentration of authority. 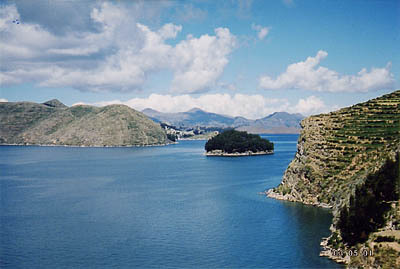 View of Snake Island and Lake Titicaca from the Island of the Sun. We returned by train to Cuzco and checked back into the Libertador Hotel, exhausted from the long ride and, in my case, from a rapidly developing cold. The next morning we boarded yet another train to Puno, located on the shores of Lake Titicaca in extreme southern Peru. The train ride was pleasant and scenic, but rather choppy. We arrived at Puno in the evening and checked into our hotel, ate dinner, and slept. The next morning we took a boat ride on Lake Titicaca to the Islands of Uros, which are island-like platforms of floating totora reeds. According to legend, Manco Capac, the first Inca, and Mama Ocllo, his sister-consort, rose from the waters of Lake Titicaca to found the Inca Empire. They are said to be the forebears of the Uros, whose descendents now inhabit the floating islands. The Uros live a communal life that has not changed in centuries. The totora reed is the building block of their economy. It is used to build the floating platforms on which the Uros live. Houses and boats are made from the reed and young shoots growing below the surface of the water are nutrient-rich and edible. The Inca Ullo temple of fertility, Chucuito, Lake Titicaca. We left the lake temporarily to cross the border of Bolivia and visited Copacabana, an ancient religious sanctuary located on the south side of Lake Titicaca. 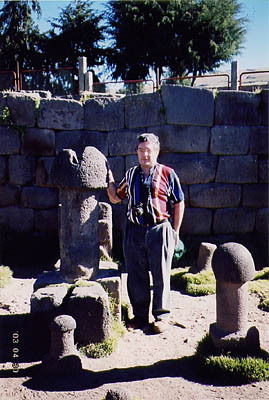 The area is rich in archaeological remains, including the phallic temple Inca Ullo, devoted to the cult of fertility. The lake islands enjoy a climate and soil ideal for growing Andean flowers and trees. As my head cold was fully developed at this point, our guide brought us to a restaurant for lunch and had the cook brew a mix of eucalyptus and mint that we had picked along the way. The boiling herbs were brought to me with a serape that our guide placed over my head. I then inhaled the steamy aroma and felt my sinuses clear as my breathing was restored. We enjoyed a catamaran ride to the Island of the Sun, which is said to be the birthplace of several deities, a source of magnetic energy, the vertex of the earth, and the mystic cradle of the Inca empire. The Incas believed that the sun rose each morning from Lake Titicaca and that Manco Capac and Mama Oclla appeared here and founded the Empire of the Sun. We met a builder of boats from the ubiquitous totora reed on the island and then were treated to a Kallawaya shaman's ceremony before setting sail on a totora reed boat. After a full day, it was difficult to say goodbye to the stunning natural beauty of Lake Titicaca, the world's highest navigable lake. We departed by bus for La Paz. 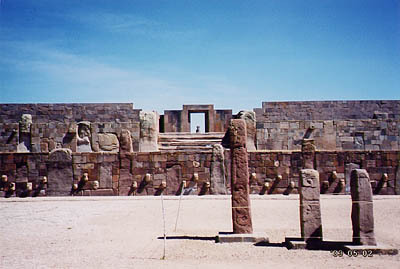 Sunken courtyard of the Temple of Kalasasaya, Tiwanaku, Lake Titicaca. The city of La Paz is approached from the suburb of El Alto, which is located on an escarpment about 1,000 feet above the moon crater that is La Paz itself. The unusual topography makes La Paz one of the most visually interesting cities we have ever seen, but the outstanding 16th century colonial architecture is not to be overlooked. The central city contains the historic Church of San Francisco, a fine example of the Spanish colonial style. Our guide pointed to a particularly beautiful building that was riddled with bullet holes. He explained that in February there was a student demonstration and the police came to disperse the crowd. Within minutes, the army arrived from the other direction. The students scattered, he reported dryly, but in the meantime, the police and army got into a scuffle, resulting in pock-marked outer walls and shot-out windows. Located near the city of La Paz is Tiahuanaku, dating back to 1580 b.c. The ruins form part of what was believed to be the largest city in the world by around 700 a.d. 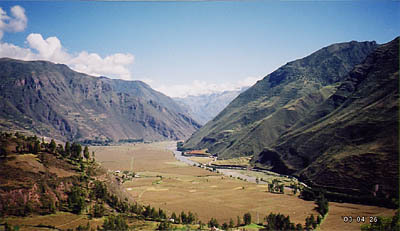 The Incas subsequently discovered the deserted city in the 11th century and quickly recognized the building techniques and advanced agricultural development. The Aymara civilization founded Tiahuanaku and their successors live to this day in Bolivia and southern Peru and speak the ancient language of the Altiplano natives. 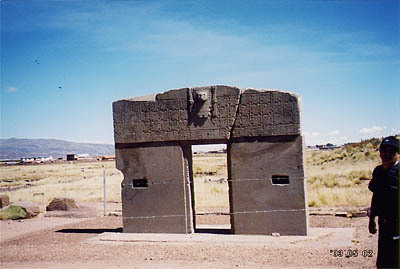 La Puerta del Sol, Tiwanaku, Lake Titicaca. We headed for the airport on the morning of May 4, filled with wonder over our discovery of the heart of South America. The trip fulfilled a lifetime goal for me to see Machu Picchu and my 50th birthday will be etched in my memory forever as a high point in my travel career.